Grant Gilchrist grins sheepishly as his gargantuan frame squirms and shudders atop the dining chair that barely contains it. "I just hate how quick they are," he grimaces. The lock is describing, with comical anguish and the beginnings of a blush, his darkest fear. No, not the mighty Springboks pack, with whom he may do battle in Scotland's World Cup pool. Not missing selection for the global showpiece, kicking off in September. Not even a recurrence of the forearm fracture that kept him from rugby for almost nine months, snatching away the Autumn Test captaincy that had been his for mere days. "When we first moved to Edinburgh, I stayed in a flat that was riddled with mice," the 24-year-old adds gravely. "I could hear them scratching under the floorboards and I just hated it. "The thought of going to sleep and thinking of them crawling up..."
Gilchrist has had ample time to ponder the fleet-footed rodents that were his nightly torment. Only now is he ready to take the field following the freak ruck collision that cracked his exposed radius and ulna during a brutal slugfest of a European tie with Lyon in late October, where five Edinburgh men were felled before half-time. The injury stung, and stung hard. But if the immediate pain was excruciating, the timing was more torturous than any amount of physical agony. Four days prior, he had been announced Vern Cotter's surprise choice of skipper for the November fixtures. "I played on for a couple of minutes and realised it was far from okay," he recalls. "By the time I was in the tunnel I was in a load of pain. I knew my immediate commitments with Scotland in the autumn were probably gone. "I was trying to be pretty philosophical about it. It was really unlucky timing, but when I was sat in hospital, I was in a load of pain and I wasn't going to sit there and beat myself up about what ifs." Gilchrist has the scars to track his suffering. His right forearm bears two long, matching legacies of the surgeries and bone grafts required to repair him. Perhaps the deepest wounds, though, were inflicted emotionally. A failed bone union added months to his recovery, trying his resolve and ending his season. 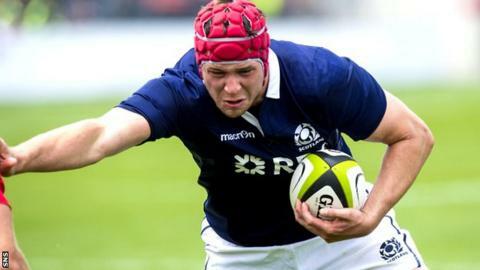 In his stead, Jonny Gray and talented young club-mate Ben Toolis prospered. "I found it difficult, big quarter-finals, semi-finals with Edinburgh, the Six Nations, not because I wanted the guys to do badly, or I felt they were doing well, it's on those big occasions when it sinks in that you're missing out," he explains. "There were times where I didn't want to come to the games, I'd sit and watch on TV. There's always a part of you that's going to try and take you away from thinking rationally - this isn't fair. "I got away on holiday for a couple of weeks, caught up with family, friends. That's what gets you through." Gilchrist was strained, but he did not buckle. He did not wallow in his own misfortune or succumb to the devil on his shoulder. Instead, the stricken lock attacked Edinburgh training sessions, analysing opponents, and guiding green Toolis. "Knowing I couldn't do things on the pitch, I certainly could invest as much as I could in the club and try and help the guys as much as possible," he reasons. It's more than a predisposition to selflessness, or a coping mechanism to compensate for his ills - rather an indication of the maturity and character that prompted Cotter to label Gilchrist "a born leader". He emerged from modest beginnings, in a rugby sense, at Alloa RFC - "just a small club down the bottom of the leagues" - progressing to Stirling County, and Scotland age-groups in time, where his leadership shone bright. It was a trip to Christchurch, New Zealand, though, on Scottish Rugby's 2011 Macphail Scholarship that profoundly shaped his career. Mentored by All Black Sam Whitelock, the four-month journey moulded his development, not just as a talented athlete, but an ambitious young man. He learned how the best carry themselves away from the sport. He admired their humility and craved their respect. Gilchrist returned to Edinburgh invigorated and energised and ready to take on the world, enjoying one of his finest seasons in the boiler house, and earning Scotland honours in early 2013. "Going out to a place like that just forces that independence," he says. "You might have been at Edinburgh for a few years, know everybody and its easy, but if you go out there you're a brand new guy, you need to prove yourself, get on with and mix with guys, and that will stand you in good stead for life. "That experience of being out your comfort zone as a person and a player helps you. Coming back, I had to earn the respect of the older guys - Allan Jacobsen, Ross Ford, who had played countless Test matches, 200 games for Edinburgh, and I'm pushing behind them in the scrum." His captaining a depleted Scotland in two summer Tests raised few eyebrows, but with just eight caps, and a host of experienced rivals, Cotter's nominating him for the more significant autumn trio was bold. Gilchrist is a shrewd leader in spite of his lack of years or international minutes, picking his moments to speak with great care, and subtly managing the resources and skill-sets at his disposal. "I'm not a big shouter; I think there's a time and a place," he says. "If you're leading by example and saying the right things at the right times, that's what it's about. "The support of the older guys is something as a younger captain you need to have otherwise you're going to struggle. If they don't have respect for you, or they're not willing to help you, you're going to be up against it. "The best captains are the ones that are willing to use the experience of others - even if I didn't have the experience at international level, there were other guys who did, and I could use them. "But when it comes to the big moments, you've got to back yourself." Next month, the four World Cup warm-up matches that will hone Cotter's selection are crucial to Gilchrist's tournament hopes - thoughts of the captaincy that might have been his remain peripheral. "I can't go to a World Cup without playing well in these games; 10 months is a hell of a long time," he admits. "The likelihood is that everybody will get a shot. I hope I'll be getting a good chunk of game time, and I'll need that to prove myself and get in a good fit state." Maybe the notoriously rugged coach spies a glimpse of himself in Gilchrist. Certainly, he'll be satisfied his towering totem is ready, informed by experience, steeled by the bitter blow of injury, and thirsting for rugby. The mice under the floorboards are a distant memory.